A client in the office furniture industry approached Acme Screw Corporation in need of metal forming of a 10B21 steel locking lever. The part was to be used as an adjustment for a chair in a high-end office environment. We straightened and cut the steel from a coil, to 9-1/2" long. Then we rolled a groove on one end. 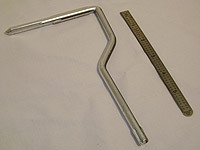 We bent and flattened the part to the required shape while forming nibs. We then trimmed it to the specified dimensions. The opposite end was extruded according to our client's size and shape requirements, then we shaved the point and swedged the ears in a press. Finally we performed heat treatment and zinc plating with black zinc phosphate. Working within tolerances of +.000/-.008", the finished product measured 4.630" long and 4.768". 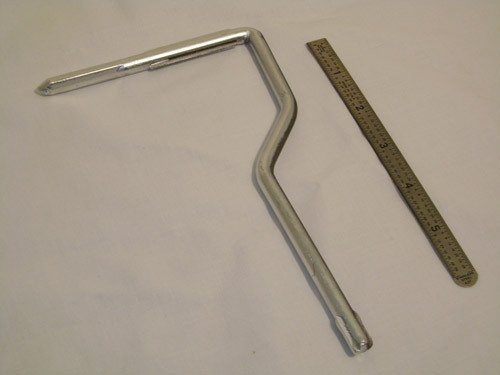 When we delivered the steel bent locking lever to our client, they were thrilled to see that we had expertly completed the task and exceeded their expectations. To learn more about this particular project, or for more information on our other products and services, please contact Acme Screw Co. Overall Part Dimensions Length: 4.630"